Otherwise known as Gymnastic bars or Dipping bars, Parallettes are a fantastic piece of training equipment that can be used to train a wide variety of bodyweight and gymnastic exercises. Because parallettes are small and versatile, they are one of the best things to purchase as your first piece of home gym training kit. This also makes them perfect for carrying around on the move such as when staying in a hotel. Because of their design, they’re extremely scalable to suit a wide range of fitness levels from bodyweight beginners to well-versed calisthenic artists. What should you take into account when purchasing a pair of Parallettes? The table below provides an overview of the different parallettes we reviewed, ranked best to worst. Click on any title to check its current price. Below is our list of the top 6 parallettes, based on a combination of quality, value and suitability. Gravity Fitness first sent me a pair of their parallettes to review back in 2016, and they quickly became my personal go-to pair. 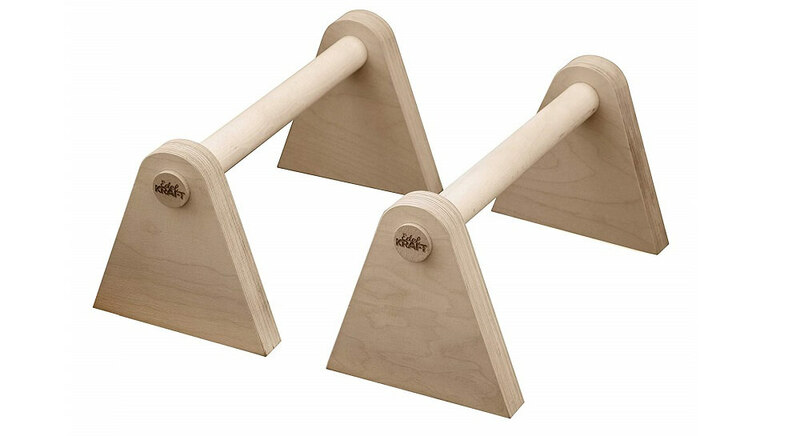 At 45cm long and 30cm high, they are fantastic as a pair of home parallettes which you can use to practice handstands, planche, L-sits and many more exercises, all from the comfort of your own home. The Gravity Fitness parallettes are made from steel and have a matte grip, which will feel very familiar for those who regularly use steel pull up bars or frames. Gravity Fitness have managed to build themselves a great reputation in the Calisthenics world for being the most competitive seller in terms of value, whilst still managing to maintain a high quality with all their products. At around £40, it's safe to say Gravity Fitness Pro Parallettes are our top choice. They even offer a lifetime warranty money back guarantee for those still to be convinced. skillworx's parallettes ooze of class, and you can't get a more sophisticated finish than the natural beech wood finish they offer. If you're not constrained by budget then these are the best on the market, however, most of skillworx's models are over £100 which push them down to 2nd rank on our list due to not being the best choice for value. skillworx parallettes come in either a "Raw" or treated variety; with Raw, the wood is untreated which adds to the natural style Skillworx offer, but if you're looking for something more resistant to dirt and our unpredictable UK weather, then you may want the treated variety. In terms of size, the skillworx parallette bars sit 30cm above the ground, and a bar length of 55cm, making them a good choice for many different skills and exercises​. These parallettes by PULLUP & DIP are a fantastic hybrid, mixing natural beech wood handles with a steel base to create a product which is both beautifully designed and ticks all the right boxes functionally. The handles are designed to be a little thicker than the standard steel handles used by other brands, giving an ergonomic grip that is safe on the wrist and doesn't slip when your hands get sweaty. The parallettes are priced between the Gravity Fitness parallettes and skillworx parallettes, making them an excellent mid-choice product for those looking for top quality without picking the most expensive parallettes on the market. The parallettes are available in two different sizes; 'low' and 'medium'. The medium parallettes offer you an ideal handle height of 30cm, whereas the low parallettes offer a handle height of 10cm. Both parallettes have a bar length of 50cm. The medium parallettes can be used for numerous exercises, such as L-sits, push-ups, handstands, sitting dips and planche, whereas I would only recommend the low parallettes for the more advanced gymnastic skills such as handstands and planche. FunctionalFitness offer the cheapest "Soft handle" style of parallettes on the market, and also feature non-slip rubber end caps on each of their feet, making them safe for use on any floor surface without having to worry about the parallettes slipping during use. These features may be attractive to first-time parallette buyers, but for more advanced users the handles may simply get in the way of certain exercises. The parallettes also don't have a similar feel in quality as some of the better parallettes on the market. Mirafit parallettes are our recommended choice for anybody who is looking for a bar which can be used to perform dips on. At 90cm high, Mirafit's parallettes are closer to a dip bar, yet are stable enough to be used for exercises that suit parallettes. If you're completely new to the world of bodyweight workouts, then we'd suggest choosing this Mirafit bar. You will get much more use out of it as a dipping bar in your beginner stages whilst you are unable to perform the more advanced moves suited to parallettes. Edelkraft parallettes are only 8 inches high, but they offer the same natural wood look as Skillworx and are unique in that you can quickly assemble and disassemble them for easy travel. Simply turn each end 3x to take the parallettes apart. Again, the natural wood style parallettes can be quite pricey, as these are also close to the £100 mark, but for anybody looking for a fantastic looking pair of parallettes which can be transported easily, then Edelkraft is your choice. In this section, you can find out more about exactly why this piece of kit should make up some part of your training and also, some of the things you need to take into account when choosing a pair of Parallettes. Parallettes come in a variety of shapes and sizes, so it’s important to pick the length and height that best suits your needs. Smaller parallettes will obviously be more portable and also more suited to exercises like the push-up to allow you greater depth whilst keeping the movement relatively similar. Taller parallettes can be used for more advanced movements such as planche variations where you need to really get your whole body off the floor. As well as this, larger parallettes will also allow a greater level of mobility and movement through the exercise which is useful for more active exercises opposed to just static holds. Larger parallettes tend to also be more stable due to their larger base. When purchasing any piece of equipment, you really want to make sure that your investment is going to last. Parallettes are no different as they need to support your entire bodyweight. You can find parallettes in a range of materials from steel to wood. Metal tends to be stronger and more durable, but many people find that wood not only looks nicer but feels more comfortable. One of the biggest benefits of parallette bars is that you can carry them almost anywhere with you. So, no matter where you are, you can always get in a good workout, especially for your upper body. Parallettes are perfect for those who are constantly on the move and can never find a suitable gym or spot to workout. Essentially, this piece of equipment allows for you to carry your gym with you. If you couple parallettes with a few other small and nifty pieces of kit, then you’ve always got the opportunity for an effective exercise session.